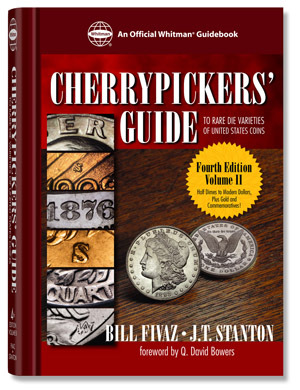 The Cherrypickers’ Guide to Rare Die Varieties by Bill Fivaz and J.T. Stanton is a best-selling numismatic book. “Cherrypicking” refers to finding coins priced below their true market value, most commonly valuable die varieties which have not been attributed as such by the seller. As the size of each edition has expanded with the inclusion of more entries, the authors decided to split the 4th edition into 2 volumes. Volume 1 was published in early 2000 with plans to release Volume 2 by the end of that year. For various reasons, Volume 2 is still not available. Finally, arrangements were made several months ago for Whitman Publishing, which has released dozens of numismatic titles, to publish Volume 2. It will be shipped in August. You can preorder the book at Whitman Books for $39.95 plus shipping.